The mission of the Hamilton-Wenham Food Services department is to prepare nutritious, affordable and appealing meals for the school community and to provide the children with nutrition education for lifelong healthy eating habits. Menus are planned to meet the recommended dietary allowances (RDA's). Our goal is to keep weekly menu averages below 30% calories from fat. Nutrient analysis and ingredient information is available by request. Menus are created monthly and reflect the students' tastes by offering the choices most popular to students. A complete lunch costs 3.25 and includes the following components: Meat and/or Meat Alternate, a variety of Fruits, Vegetables, Grains (mostly whole) and Milk (skim, low-fat and flavored). Students are encouraged to select items from all groups. Snacks - a variety of snacks are offered at all schools. All of our snacks meet the standards required by the Massachusetts Competitive Foods Bill which was signed into law in July of 2011. For more information please visit the Mass-in-motion website. If you have questions, please contact the Nutrition Service Director at 978-468-0398 or c.donovan@hwschools.net. Families are reminded that Free and Reduced Meal benefits can be applied for at any time during the school year. Applications are available below or by contacting the Food Service office at 978-468-0398. 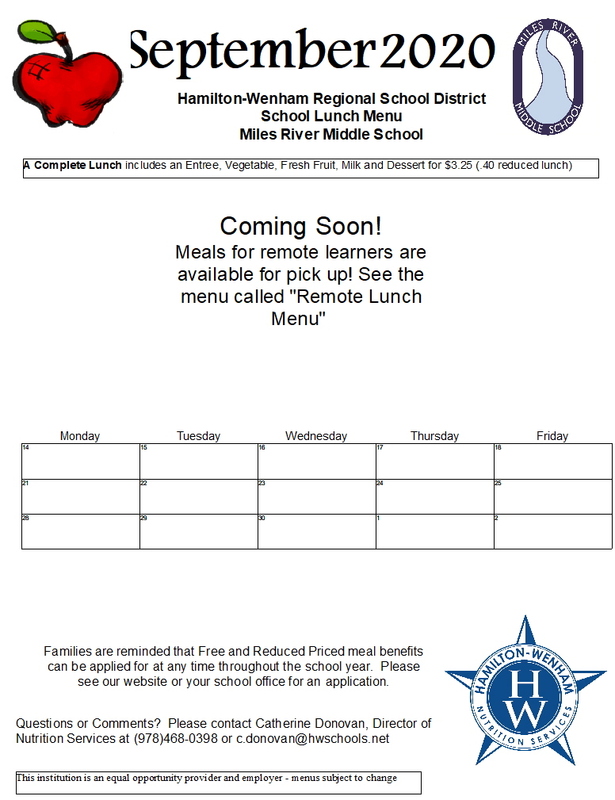 The Hamilton-Wenham Regional School Lunch Program uses a computerized Point Of Sale (POS) system. Each student will be given a PIN number (which remains the same until graduation) and is used at the lunch-line registers when purchasing lunch. Please call or email the foodservice office to obtain your child's PIN (978-468-0398 or c.donovan@hwschools.net. If your child forgets or doesn't know his/her PIN, he/she need only ask the cashier. To help increase the efficiency of the lunch lines, we strongly encourage using the "Debit Account" to pay for your child's meals. Payments can be made online at myschoolbucks.com and the monies will automatically be deducted from the account every time the child's PIN number is entered at the register. Payments can also be made by check for weekly or monthly amounts. If the student is absent, the monies remain in the account until used. Any unused balances at the end of the year will automatically be transferred as beginning balances for the next school year. Special arrangements are made for students who do not have a lunch from home, cash or money on account. Can I make payments to multiple children's accounts with one payment? Yes. You will need to enter a specific payment amount for each child. Can I receive an email when my child's account balance is low? Yes. If you use an online account, you can establish an account balance notification threshold for each child. Once the account balance falls below the established amount,you will be notified by myschoolbucks. How do I find out what my child has been buying for lunch? The letter sent home gave me an option to OPT OUT. What does that mean? If you choose to “opt out” you will not be able to view your child(ren)’s purchases for the previous 30 days or make online prepayments. Your child(ren) must still use their PIN’s each time they come through the cafeteria line. Does my child need to use their PIN? Yes, all children must use their PIN’s each time they come through the lunch line. What if my child only buys milk? Snack? Infrequent lunches? We still encourage you to prepay. You can put a small amount on account. You do not need to make the transaction online. Avoid the $1.95 charge by sending a check or cash to the school cafeteria. What is in place to prevent another child using my child’s PIN? The PIN numbers are linked to the student's pictures. Each time their PIN number is entered into one of the registers, the student's picture will appear on the screen. The cashier will verify the student matches the picture on the screen. If they don't match, the cashier will not allow the meal to be purchased. Can I prevent my child from purchasing multiple school meals or ala carte items? What happens to the money at the end of the school year? Funds in your child’s account will roll over to the next school year. If your child is graduating or moving out of the district, arrangements can be made to reimburse you. Contact the food service office. Can I still use the blue tickets? No, the blue tickets expired at the end of last school year. How long after I make a payment will the money be available in my child/ren’s account? Online payments are generally processed by PayPal within 24 hours. However, if the payment option selected is an e-check, the processing will take anywhere from 4 to 7 business days. Checks sent to the school will be available as soon as they are given to the cashier. Can I change my child’s PIN? Yes, just call the food service office 978-468-0398. I just moved to the district, how do I sign up? Your child will be automatically in the system. Contact the food service office 978-468-0398 or c.donovan@hwschools.net for all of the information you will need for online payments or other questions. Unlike many other departments in the school, the Food Service Department is a financially self-supporting, non-profit entity and must generate its own revenue to cover its expenses. School food service departments are the entities responsible for providing school meals. This involves purchasing food, paying staff salary and benefits, as well as repairing and replacing equipment. Contrary to popular belief, the food service department does not receive money from the school budget or the local government. In fact, many food service directors also pay a portion of the district’s overhead costs including building utilities and custodial services. School food service departments must have at least 1-3 months of operating money in their accounts to cover any unforeseen expenses and ensure that the program runs smoothly. Revenue for school meals comes from federal reimbursements that subsidize part of the meal costs, student payments for full price and reduced price meals, adult meal payments, a la carte food and beverage sales, and any vending or catering that the food service director offers. But doesn’t the federal government reimburse schools for the full price of the meals? No. Federal reimbursements cover a portion of the cost of school meals, but not all. According to the School Nutrition Association, the estimated average cost to prepare a school meal in 2008 is $2.90, yet the maximum federal reimbursement for a free lunch in SY 2008-09 is only $2.74. This means that food service departments lose money on every free meal that they serve. Does that mean that the kids who pay for their meals subsidize the free meals? Is that why meal prices are going up? Rising food and fuel prices nationwide and the higher cost of healthy foods such as fresh fruits and whole grains have put significant financial pressure on school food service departments. School districts nationwide are increasing their prices in order to cover their costs. All meal price increases must be approved by the local school board. Why does the price of food matter? Don’t schools get free food from the government? While school food service departments receive some low cost food through the U.S. Department of Agriculture’s (USDA) Commodity Food Program, this represents only 20% of the food used to prepare school meals. The other 80% is purchased from food vendors at a market rate. To keep prices down, many food service directors order through purchasing collaboratives with other school districts. However, food service directors are still feeling the impact of price increases for milk, cheese, and eggs as well as the higher cost of fresh produce and whole grain bread. Would it be cheaper to make my child’s lunch at home? Despite price increases, school meals are still a great deal! The School Nutrition Association cost estimates show that an equivalent meal prepared at home, including milk, a meat or meat alternate, grains, and fruits and/or vegetables, would cost parents $3.43!